The ultimate tropical paradise destination with miles of white sandy beaches and blue sea, tropical rainforest, ancient Mayan ruins, and plenty of cayes and smaller islands to explore. Belize is home to the second longest barrier reef in the world (after the Great Barrier Reef in Australia) and offers some of the best scuba diving and snorkelling. Coral and sea life are abundant in the Hol Chan Marine Reserve with nurse sharks, dolphins, manatees, hawksbill turtles, and stingrays. Seahorses, parrotfish and other tropical fish can also be found among the mangrove forests that act as nurseries. For more experienced divers, the Great Blue Hole is a famous spot off the coast that measures 984 feet across and 354 feet (108 meters) deep. 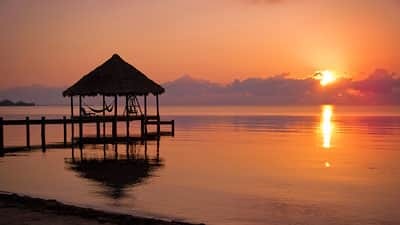 Sitting at the tip of the narrow Placencia Peninsula in Belize is the laidback fishing village of Placencia. Snorkel at Laughing Bird Caye, look for jaguars in the Cockscomb Basin Wildlife Sanctuary or stroll along the palm-lined beaches that are renowned for being the best in the country. Nearby in the Toledo District, explore the mysterious ancient Mayan ruins and archaeological sites Nim Li Punit and Lubaantun. Once home to one million Mayas, there are several Mayan ruins and tombs to explore across the country, including the more famous Lamanai and Xunantunich. Enjoy sunny skies from December to April. Watch out for heavy rainfall from May to November.